This 2BR and 2BA pet friendly villa! Remodeled kitchen, master bath, new tile floor throughout, and adding new comforts, furnishings and all the extra essentials needed to make your vacation stay more pleasurable are just the beginning to the wonderful changes happening to this villa with much more to follow. You will be delighted to see that both bathrooms have been totally updated with granite and tile and the open floor plan provides ample natural light which adds to the spaciousness of this villa. It is located on the second floor with a great view of the lagoons and the golf courses. Beachwalk is a 3 minute walk to the beach and a short drive to shopping and plenty of restaurants. Shipyard Plantation has 2 convenient access gates to Pope Ave and 278 on the South End of Hilton Head. We offer wonderful shaded biking and walking paths throughout the neighborhoods along with a beautiful beach, golfing and Van Der Meer Tennis Club where Billie Jean King got her start in tennis. Now you get to vacation with your entire family in Hilton Head! Our beaches are pet friendly until 10am and after 5pm all summer and are welcome all day after September. We have many restaurants that are pet friendly along with our outlets and malls welcoming pets. Come experience Hilton Head Island were we welcome all family members! Our primary residence is in the Atlanta area and have lived there for 30 years. We absolutely love everything about Hilton Head and when the opportunity to purchase 108 Beachwalk came our way we knew we had to jump on it. It has become our home away from home and try to visit as often as we can. We hope that your visit to our villa will make you feel as comfortable and at home as it does us. We have been visiting Hilton Head for over 25 years and enjoying it tremendously. We brought one of our dogs, Justin last year and in doing so we met many wonderful people and their dogs on the beach, we fell in love with Hilton Head all over again. Hilton Head has so many dog friendly restaurants, it makes it easy for you furry child to feel right at home. too. We choose Beachwalk in Shipyard over the other locations because it is the closest complex to the beach. Shipyard has miles of bike/waliking paths, golf that is second to none, and wildlife that you will want to just sit back and enjoy. There is a wrap around porch on our villa with views of the lagoon that is home to a very large alligator, Herons, turtles, and many more of Hilton Heads wildlife. The Shipyard golf course can also be viewed from the deck and Van de Meer Tennis club where Billy Jean got her start is just steps away. Had a wonderful 2 week stay. The condo was absolutely perfect for my husband and labradoodle. We rode bikes everyday, walked the beach, golfed and ate at all our favorite places. We were close to the beach and close to colignie plaza. Barbara was always available if needed but we really didn't need a thing. Condo is equipped with everything you need. We loved the location, steps to the beach. We appreciated being able to bring our little fur baby. Barbara is responsive to questions and helpful. The beach locker and bikes are great amenities. The neighborhood has beautiful walking/bike trials. This was our first trip to HHI and we will be back! Beautiful Condo.. even better Owner! The condo was amazing. Completely updated. Has everything you will ever need in kitchen. Very clean. The location is as good as it gets in that area for beach access. Barb an husband are the best. Respond to any questions immediately. You will not find a better condo rental. I have rented a lot of condos in Hilton Head. This was by far the best. 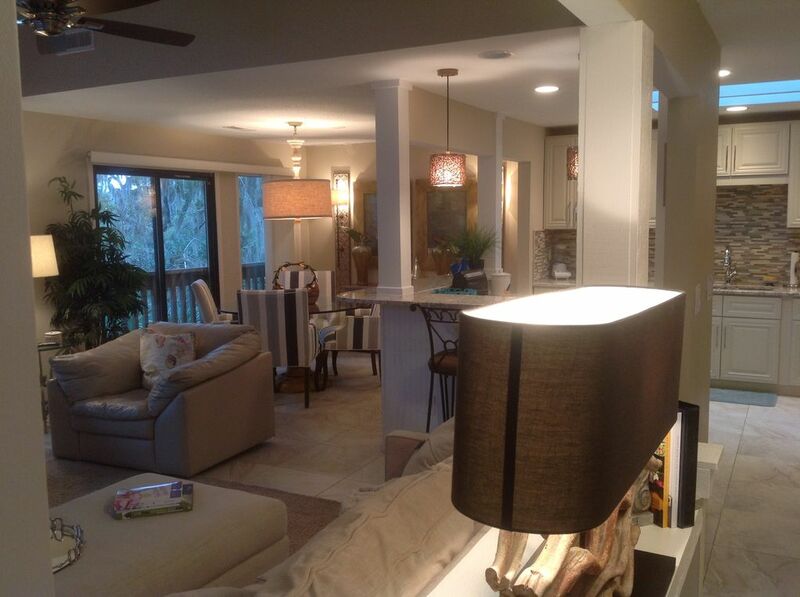 Condo was spacious and very clean - decor was beautifully done! Kitchen is well-stocked with quality cookware and kitchen utensils. The condo appears to have a new washer and dryer. Property has a gas grill that belongs to this condo which we used one evening. I especially liked being on the second floor with a gate that closes in case you have a dog or small children. Riding bikes around Shipyard is such a great family activity; we rode to several places to eat breakfast and lunch. While the condo is supplied with 2 bikes, bike rental companies are in abundance. We rented a couple more bikes from PEDALS which were promptly delivered to the condo. I would also recommend checking out H20 water sports in Sea Pines - our family enjoyed the Stand Up Paddleboard tour and the Sumo 38' Sailing tour. The owner, Barbara, is quick to respond to any issues and is very thoughtful and kind - the type of person you would want to rent from! You are so kind and we are so very happy you enjoyed HIlton Head as it really is our favorite place! Week at the Beach with our Pooch! We had a great week staying in your villa! It was beautifully decorated and had everything we needed for the week! The unit was a very close walk to the beach which was nice! Thank you for sharing it with us! We are so happy that you enjoyed your stay!!! Great beach trip with hotel amenities! The condo is amazing. It’s comes with everything you need even down to the beach chairs for the beach. The beds are so comfy and feel better than most hotel beds. Barbara is super responsive throughout the whole process. We had an amazing first trip to HHI and I can’t wait to go back and stay at the condo again. AWWWW Cassandra, Thank you so much for the kind words. We are so very happy that you enjoyed your stay. You guys were great guests also and look forward to your return. 45 Minute Ride to Savannah, GA; 50+ Golf Courses in the Area; Great Outlet Shopping, and a new outside Mall.